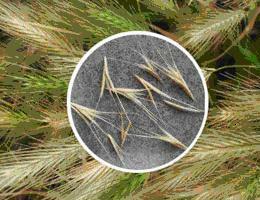 Foxtails – What are they and why should you be concerned? Foxtail plants can be risky for your dog. The barbed seed heads of the foxtail plant can work their way into any part of your dog or cat, from the nose to between the toes and inside the ears, eyes and mouth. They can even simply dig themselves directly into a patch of skin. The danger of foxtails goes beyond simple irritation. Because these tough seeds don’t break down inside the body, an embedded foxtail can lead to serious infection for your dog. It can even lead to death if left untreated. The seeds can be hard to find in your dog’s fur. Foxtails travel. Moving relentlessly forward, never back, they can migrate from inside your dog’s nose to its brain. They can dig through skin or be inhaled into — and then perforate — a lung. Feet. Foxtails love your dog’s feet and can easily become embedded between tender toes. Check for foxtails if you notice swelling or limping or if your dog is constantly licking the area. Ears. If your pooch is shaking his head, tilting it to the side, or scratching incessantly at an ear, this could be the sign of a foxtail — one that may be so deep inside the ear canal you can’t see it. Your veterinarian needs to take a look using a special scope. Examining your pet’s coat during foxtail season — generally May through December — especially if you’ve gone walking in open fields. Brush your dog as necessary, looking especially closely for pointy foxtail awns in your dog’s thick or feathery fur. Check your pup’s face and ears carefully for foxtails. Don’t forget to look in and around your pooch’s mouth and gums. Carefully check your dog’s paw pads for foxtails — especially between the toes. Use tweezers to remove any foxtails you can easily get to. But if a foxtail is deeply embedded, or if the area around it is red or swollen, call your veterinarian right away. Remember, foxtails won’t come out on their own, and they can burrow into the brain, spine, eardrums, lungs — actually, anywhere. The easiest way to prevent foxtail problems is to keep your dog out of overgrown, grassy areas. You should also pull out any foxtail plants you find in your yard. Also consider trimming your dog’s fur during foxtail season, especially if it tends to persistently get foxtails in one spot.